The Alumni Association isÂ holding a month-long effort throughout April to serve communities all around in the world in a Global Month of Service. AÂ cleanup will beÂ held at the University of Rhode Island’s Kingston campus onÂ April 26Â from 9 a.m. to 12 p.m.Â inÂ hopes of being ableÂ toÂ clean several areasÂ ofÂ campusÂ before the end of the semester. The event is open to all students and alumni for no cost and includes a complimentary breakfast to be held in the Alumni Center at 9Â a.m. The breakfast is also where volunteers will be split into groups to cover campus grounds. This invitation also extends to families of students who may be able to participate during their spring breaks. While the Global Month of Service is not a new concept, the cleanup is a new event aspiring to become annual. “We’re starting small, but hoping it’ll grow,” said Stevens. Some main targets to clean include the outskirts of campus and the Quadrangle. About 40 people have committed to volunteer,Â but registrations are still open and coming. A linkÂ on their website (advance.uri.edu/alumni) is available for students interested in signing up. TheÂ Alumni Association has more thanÂ 65 programs and services that they manage, promoteÂ and fund. 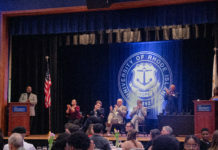 It is committed to supporting students through scholarships and plans to host more events into the summer.Â Details on becoming a member,Â joining their committeesÂ and other alumni stories canÂ be found online through their website.Â They can also beÂ found on Facebook and on Twitter @URIAlumniAssoc. Anyone with additional questionsÂ concerning the cleanup or the Alumni Association is welcomed to contact Stevens at (401)-874-4604.